Installing one of SRA Home Products’ pergolas is the perfect way to add style to your backyard in Egg Harbor Township, New Jersey, without having to sacrifice function. 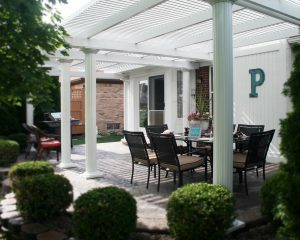 Our pergolas include various innovative features designed to maximize functionality throughout the year. For instance, we offer an operable pergola with optional motorized rafters that you can use to shield yourself from rain or sun, when needed. Freestanding — Our freestanding pergolas offer ultimate flexibility, as they can be installed anywhere around your property. You may want to place one over the pathway leading to your front door to serve as a welcoming entry point. Or you could place one in the back corner of your yard to act as a relaxing spot where friends can gather. Garden arbor — Like our freestanding pergolas, our garden arbors can be installed throughout your property without needing to be connected to an existing structure. Our garden arbors are unique, however, in that they feature an open-beam design that is perfect for encouraging climbing vines. Attached — Our attached pergolas are the ideal choice for homeowners seeking to cover a patio or deck located adjacent to their home. This style offers maximum space underneath, as it does not require supporting columns on the attached side. Each of these pergolas is available in two colors: white and sandstone. You can also choose among three column styles, all of which are inspired by the beautiful architecture found throughout the Mediterranean region: Florentine, Roma, and Venetian. If you would like to learn more about the benefits of installing one of our beautiful pergolas at your Egg Harbor Township, NJ, home, please contact SRA Home Products today.